Have you been injured in a motorcycle accident that wasn’t your fault. 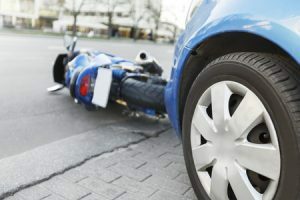 If the motorbike crash was caused by the negligent action, or inaction of another party, you could be entitled to make a motorcycle accident claim. The motorcycle compensation payout you could receive, could be worth tens of thousands of pounds. If you wish to make a motorcycle accident claim, or claim compensation for being knocked off your motorbike, you need a motorcycle accident solicitor to represent you. We are Legal Expert, a trusted Legal Advisor who specialise in matching Claimants wishing to make motorbike accident compensation claims with expert personal injury solicitors. Call Legal Expert today on 0800 073 8804 for your free legal consultation. We will let you know whether or not you have a legitimate case to make a motorbike accident compensation claims and will give you a motorcycle accident compensation example of how much compensation you could claim. In this case study we are going to tell the motorcycle compensation story of Mr B (whose name we have abbreviated for reasons of confidentiality). Mr B was 26 years old at the time he suffered his motorbike crash. Mr B was riding his motorcycle to work early one morning, when a vehicle travelling in the opposite direction swerved, colliding with his motorcycle and and knocked him off. How Common are Injuries from Motorcycle Accidents? 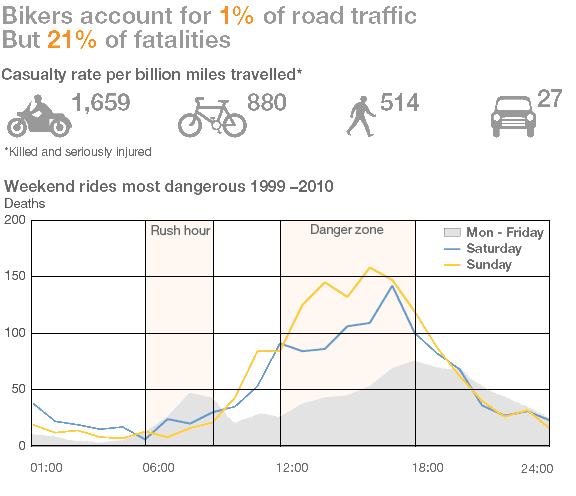 According to a report published by the Department of Transport on average in 2015, there were in 6 deaths and 94 serious injuries per week, involving motorcyclists, whilst using their vehicle.Motorcyclists are one of the most vulnerable groups of road users, as they travel at speed but there is no outer casing on their vehicle to protect them. Motorists must take extra care to avoid causing motorcycle accidents as motorcyclists have a greater chance of injury or death. After the accident Mr B was taken to hospital. As a direct result of his motorcycle accident he suffered multiple injuries. These included: a committed open fracture to his right tibia and fibula, soft tissue injuries to his left foot and soft tissue injuries to his wrist. As a consequence of these injuries Mr B had to undergo surgery, including a being fitted with a tibia nail and locking bolt and several skin grafts, and being kept in hospital for 2 weeks. This created following complications of having to have surgery the following year, to remove the metalwork. Mr B also had to undergo physiotherapy to help him regain his mobility and may need cosmetic surgery due to the scarring left on his leg. As well as these physical injuries, Mr B was also left with anxiety, post traumatic stress and other ongoing psychological damage. What’s more, Mr B was unable to work for several months after his accident and upon returning to work, lost his job because he was unable to carry out certain tasks. Although he managed to find alternative employment which involved less manual work, his new job was at a lower wage. Mr B’s legal team fortunately managed to secure interim payments for him, to help cover his loss of income when he was unable to work and his medical treatment. His legal team were then able to motorcycle accident compensation payout of [£100,000. This compensation for being knocked off his motorbike covered many areas including: pain suffering and loss of amenity, the cost of treatment such as plastic surgery, physiotherapy and cognitive behavioural therapy to help Mr B come to terms with his post traumatic stress disorder. The payment also covered his past and future loss of income, payments to help pay back his sick pay to his employers, the cost of travel expenses and gratuitous payments to Mr B’s family members who had cared for him when he was immobile. Review our motorcycle accident compensation calculator to see how much compensation for a motorbike crash you could be entitled to. Have you considered using a no win no fee solicitor to claim compensation for your motorcycle accident? If like Mr B, your accident has caused you ongoing stress and a loss of income, using a no win no fee solicitor may be the best option for you. A no win no fee service means that you will receive the same treatment as anyone else making a motorcycle accident claim, but you won’t have to pay an upfront fee. Instead, you will only have to make your payment if your claim is successful. For many, using a no win no fee solicitor is a less stressful and more affordable option. Call us today to enquire about no win no fee. If you need to claim compensation for being knocked off your motorbike, contact us today. We are a trusted legal advisory service who can partner you with the best Motorcycle accident solicitor to handle your compensation claim case, at no extra cost to you. Call us today or use our online claims form to start your motorcycle accident claim today. How Much Can I Claim For A Motorcycle Accident Claim? Help and advice for claimants involved in a motorcycle accident which left them with injuries. Advice for claiming compensation for road traffic and motorcycle accidents.